You will Watch One Piece Episode 452 English Dubbed online for free episodes with HQ / high quality. Stream anime One Piece Season 13 Episode 31 To the Navy Headquarters! Off to Rescue Ace! Shiryu saves Blackbeard and his crew by giving them antidotes to Magellan’s poison before taking the opportunity to join with them. The prisoners celebrate their escape, but some, such as Buggy, are upset to learn from a Marine officer calling on a Transponder Snail that they are on their way to Marine Headquarters, and that the Gates of Justice to Marine Headquarters will not open for pirates. 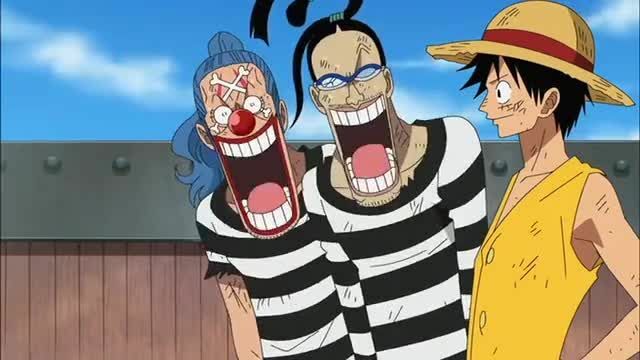 During the conversation, the officer reveals Buggy’s past in the Roger Pirates and connections to Shanks, causing the prisoners to rally behind him. While some of the escapees are concerned that Buggy will start a mutiny, Buggy manages to convince the prisoners to go with them to Marine Headquarters in the hopes of defeating Whitebeard and standing on top of the pirate world. Meanwhile, the ship carrying Ace reaches Marine Headquarters.